©2019 BREEZE PUBLICATIONS INC. Serving Pawtucket Breeze THE VALLEY FREE APRIL 10-16, 2019 'Sharing tables' taking off, reducing waste New coolers will expand the program this month PAWTUCKET – A viral video detailing how an Indiana school district is turning unused food into frozen weekend meals for students is grabbing plenty of national attention, but Pawtucket is pushing forward with its own effort to cut down on food waste and make sure hungry children are properly fed. The city's ongoing implementation of "sharing tables," previously an informal method for allowing stu- dents to take food discarded by class- mates, has taken a step forward with an expansion to more schools this year. Starting April 22, food service provider Aramark will be adding ice packs and soft-shell coolers, allowing more items to be saved and given to students who need or want them. Erin Dube, head of the Pawtucket School Committee's policy subcom- mittee, has been the key force behind the changes, according to school By ETHAN SHOREY Valley Breeze Managing Editor ethan@valleybreeze.com See FOOD, Page 9 BREEZE PHOTO BY CHARLES LAWRENCE High school students in Pawtucket rehearse for "West Side Story," a musical in which a modern-day Romeo and Juliet are involved in New York street gangs, the Jets and the Sharks. Rosalia, on left, played by CASSANDRA CUTELO, a junior at the Jacqueline M. Walsh School for the Performing and Visual Arts, and Anita, played by PERLA REYES, a sophomore at Tolman High School, sing the song "America," during rehearsal last Wednesday. PAWTUCKET – The city's three high schools are ganging up to pres- ent the iconic musical "West Side Story," a show the cast and crew say is important and timely given today's current political climate. The musical, a modern day "Romeo and Juliet" set in 1950s New York City featuring rival street gangs, the Sharks, from Puerto Rico, and the Jets, a white gang, will take place on Friday, May 3 and Saturday, May 4, at 7 p.m. and Sunday, May 5, at 2 p.m. in the Tolman High School auditorium, 150 Exchange St. in Pawtucket. 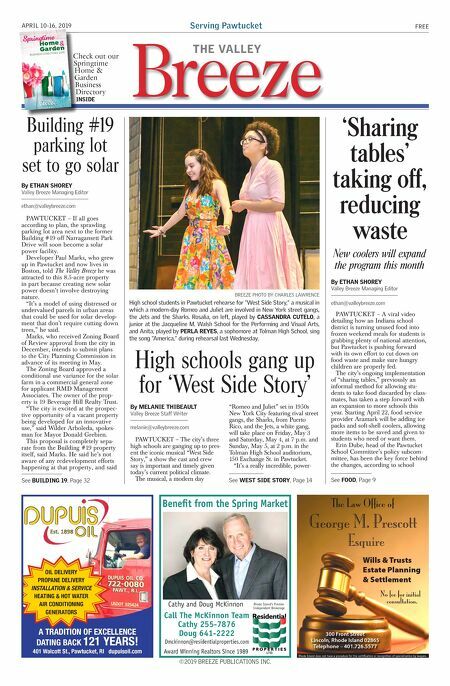 "It's a really incredible, power- High schools gang up for 'West Side Story' By MELANIE THIBEAULT Valley Breeze Staff Writer melanie@valleybreeze.com See WEST SIDE STORY, Page 14 PAWTUCKET – If all goes according to plan, the sprawling parking lot area next to the former Building #19 off Narragansett Park Drive will soon become a solar power facility. Developer Paul Marks, who grew up in Pawtucket and now lives in Boston, told The Valley Breeze he was attracted to this 8.5-acre property in part because creating new solar power doesn't involve destroying nature. "It's a model of using distressed or undervalued parcels in urban areas that could be used for solar develop- ment that don't require cutting down trees," he said. Marks, who received Zoning Board of Review approval from the city in December, intends to submit plans to the City Planning Commission in advance of its meeting in May. The Zoning Board approved a conditional use variance for the solar farm in a commercial general zone for applicant RMD Management Associates. The owner of the prop- erty is 19 Beverage Hill Realty Trust. "The city is excited at the prospec- tive opportunity of a vacant property being developed for an innovative use," said Wilder Arboleda, spokes- man for Mayor Donald Grebien. This proposal is completely sepa- rate from the Building #19 property itself, said Marks. He said he's not aware of any redevelopment efforts happening at that property, and said Building #19 parking lot set to go solar By ETHAN SHOREY Valley Breeze Managing Editor ethan@valleybreeze.com See BUILDING 19, Page 32 OIL DELIVERY PROPANE DELIVERY INSTALLATION & SERVICE HEATING & HOT WATER AIR CONDITIONING GENERATORS A TRADITION OF EXCELLENCE DATING BACK 121 YEARS! 401 Walcott St., Pawtucket, RI dupuisoil.com Dupuis Oil Est. 1898 Wills & Trusts Estate Planning & Settlement The Law Office of George M. Prescott Esquire Rhode Island does not have a procedure for the certification or recognition of specialization by lawyers. 300 Front Street Lincoln, Rhode Island 02865 Telephone – 401.726.5577 No fee for initial consultation. Call The McKinnon Team Cathy 255-7876 Doug 641-2222 Rhode Island's Premier Independent Brokerage Benefit from the Spring Market Award Winning Realtors Since 1989 Cathy and Doug McKinnon Dmckinnon@residentialproperties.com Check out our Springtime Home & Garden Business Directory INSIDE Building #19 Check out our Springtime Home & Garden Business Directory INSIDE Published by BUSINESS DIRECTORY 2019 Home Garden Springtime & ©2019 BREEZE PUBLICATIONS INC.